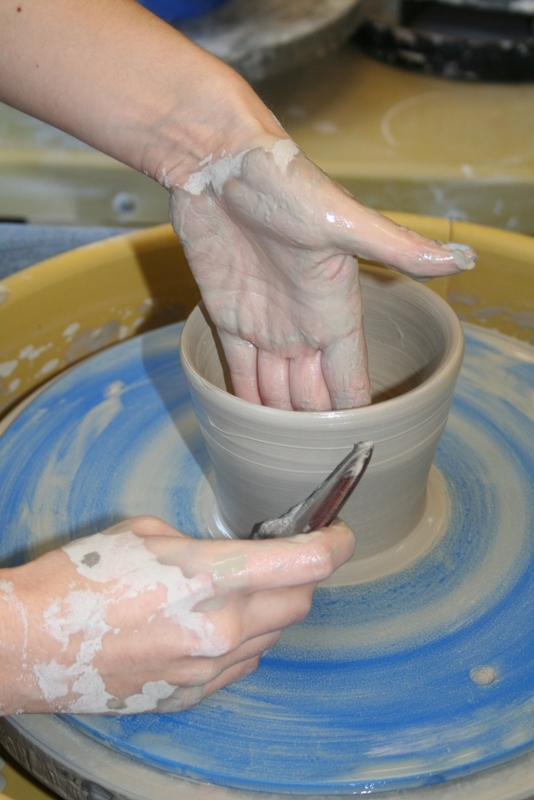 We provide one and a half pounds of clay per student and all other necessary materials, and the instructor walks you through step by step on how to make a wheel thrown piece. It’s a perfect chance to learn the basics of wheel throwing while enjoying the company of friends and other creative folks. This class is especially designed for those who have never used the wheel or who are working on basic skills. Each student will create a cup, bowl, or vase, and will choose a glaze from our studio options. Additional clay may be purchased, if you would like to make another piece during your 2-hour class. You will need to return after two weeks to pick up your finished piece and we discard finished products after 12 weeks. We guarantee the class and experience, but not the end product; sometimes pieces break in the kiln due to construction imperfections. This is a one-time class where no admittance is allowed 15-minutes after the scheduled start of the class. This policy allows teachers to have enough time to instruct and not have interruptions that affect outcome for the entire class. Students who arrive after the 15-minute window will not be admitted and will not be eligible for rescheduling.